www.tmss-bd.org published TMSS job circular on 20 July 2017. It’s a great Career opportunity to unemployed people. TMSS job circular 2017 is the most popular NGO in Bangladesh. 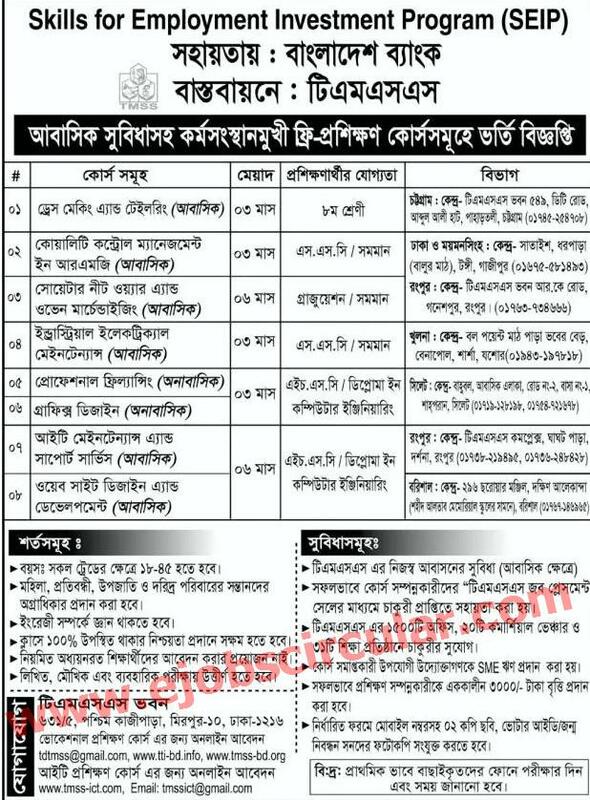 To get TMSS job circular 2017 related all information,you can visit our website that is www.ejobscircular.com . Many people want to job in private sector. At this stage,TMSS has been created a chance to unemployed people. Thengamara Mohila Sabuj Sangha think that young and energetic people is the key to success in this sector. TMMS offer to people for exciting new job vacancy. Education qualification’s is too much important for this job. Anyone,can take this opportunity. TMMS New job circular 2017 has been converted to an image file,so that everyone can read easily or download this job circular from my website. If you want to apply for this job,you should submit your application within Bangladesh bank Free Training Course. TMSS job Vacancy ,result, viva date etc all information given below. For Educational Qualification,Age limt, Salary check below this Original circular.